Porto Cervo, Italy. 5th September 2012. Following yesterday's adverse weather conditions which prevented racing, the 34 sailing giants competing in the Maxi Yacht Rolex Cup were back out dong battle on the water today. At the conclusion of a long coastal course Aegir, Nilaya and Magic Carpet 2 retain pole position in the Racing/Cruising, Super Maxi and Wally divisions respectively while Esimit Europa 2 took control of the Racing division. Among the 12-boat fleet competing for the Mini Maxi Rolex World Championship, Bella Mente now holds first place in the provisional overall classification. Hap Fauth's newly-launched Bella Mente, designed by Judel/Vrolijk and built by New England Boatworks, had a great day and took two convincing bullets ahead of Shockwave and Stig respectively in Race Two, the first race of the day, and ahead of Caol Ila R and Shockwave in Race Three. Today's excellent performance in the two windward-leeward races leaves Bella Mente, which has New-Zealand sailor John Cutler calling tactics, in first place in the overall provisional classification ahead of Niklas Zennstrom's Rán in second place and Caol Ila R in third. 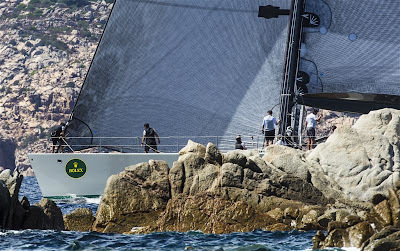 The 39 nautical mile course brought the remaining four divisions from the start off Porto Cervo west towards the coast to round the Secca Tre Monti before completing a circuit of the La Maddalena archipelago. The Maxis then left the islands of Monaci, Barettinelli, Spargi and Santo Stefano to port before heading to the Gulf of Pevero and the finish line in front of the YCCS observatory. Northerly winds of approximately 12 knots were sustained for the first part of the race but died out towards the final leg, leaving some of the large maxis struggling to get to the finish line. In the Racing/Cruising division Altair got off to a good start and although she crossed the finish line second behind Aegir in real time, was able to claim victory on corrected time ahead of Brian Benjamin's 25-metre hull and Marco Rodolfi's Berenice Bis. 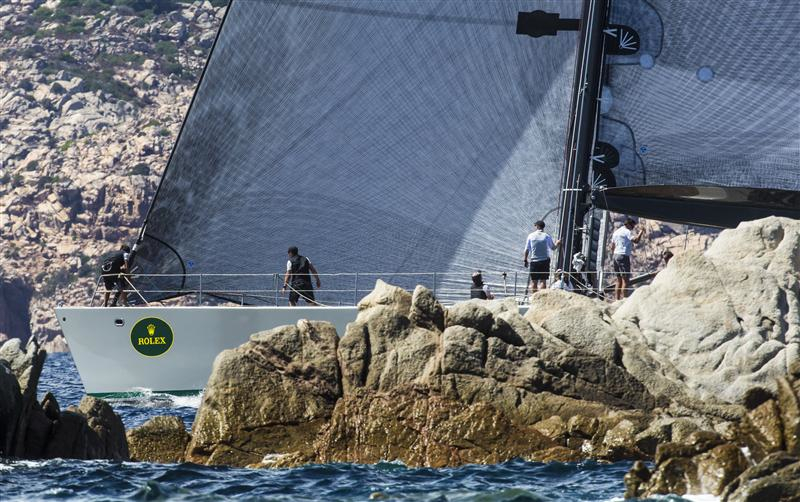 Aegir continues to hold the lead overall with Altair three points behind followed by the Swan 80 Berenice Bis in third place. Among the Racing division the pan-European team aboard Esimit Europa 2 was the first to cross the finish line today with a significant lead that allowed the 30-metre Reichel Pugh design to retain victory on corrected time ahead of Highland Fling and Velsheda. Esimit, with America's Cup veteran Jochen Schumann as skipper, now leads an incredibly tight provisional classification, on equal points with second-placed Velsheda as well as third-placed Highland Fling. Thomas Bscher's Open Season took first place in the eight-boat Wally fleet in today's coastal race ahead of overall leader Magic Carpet 2, owned by Lindsay Owen Jones. J One, with Jens Christensen on tactics, took third in today's race and also sits in third place overall. The largest yachts of the fleet, those of the Super Maxi division, were once again led by the 66-metre Hetairos in real time but it was Nilaya that triumphed on corrected time ahead of the Wally 148 Saudade. Nilaya also sits ahead of Saudade at the top of the overall classification with Peter Harrison's 35 metre Sojana in third.